The meaning of Holy Scripture reveals itself gradually to the higher senses of the more discerning mind when the mind has put off the complex bodily form of the words which are formed in it. This revelation is like a still small voice. Through a supreme abandonment of its natural activities, such a mind has been able to perceive the meaning only in a simplicity which reveals the divine Word. This is the way that the great Elijah was granted the vision in the cave at Horeb. For ‘Horeb’ means ‘newness’, which is our virtuous condition in the new spirit of grace. The cave is the hiddenness of spiritual wisdom in which the one who enters will mystically experience the knowledge which goes beyond the senses. This is the knowledge in which God is found. Therefore anyone who truly seeks God, as did the great Elijah, will come upon him not only on Horeb – that is, as an ascetic in the practice of the virtues. 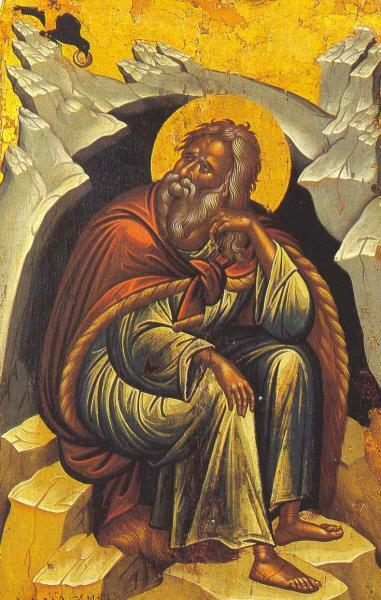 He will also encounter him in the cave of Horeb – that is, as a contemplative in the hidden place of wisdom which can exist only in the habit of the virtues. When the mind shakes off the many distractions about things which are pressing on it, then the clear meaning of truth appears and gives it pledges of genuine knowledge. These are given after it has driven off its recent preoccupations which were like scales on the eyes, just as in the case of the great and holy Apostle Paul. For thoughts about the mere letter of Scripture and the consideration of those visible things that hinder understanding are indeed scales which cling to the clear-sighted part of the soul and hinder the passage to the pure meaning of truth.